Los Angeles – In a city known for it’s glitzy, glamorous and trendsetting atmosphere, Matthew Grant Anson takes us on a journey with places that are marked by economic disparity and social issues attached to having an economy driven by international trade, entertainment and films. Anson utilizes vibrant colors and strong compositional angles to display unfettered urban life, some showing candid portraits of local personalities, others weaved into unique landscape compositions. Anson, a native to the city, finds that even after having lived in LA his entire life, is still able to discover new pockets, corners, and cultures that he was unaware existed before stepping off from the Metro. His photographs are individual documentative artifacts that tell unique and engaging stories of the people, places, and discarded objects that he meets along his expeditions. Anson, through brazen, audacious and sometimes dangerous and unpredictable means, allows us a window to the raw, unfiltered and refreshing recontextualization of the urban, social and environmental niches that inhabit the vast and boundless city of LA. 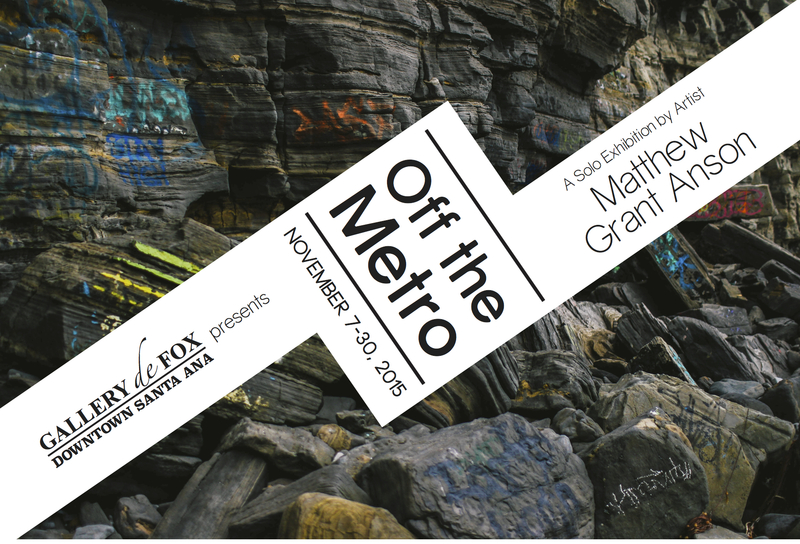 The exhibition is presented by Gallery de Fox and was curated by Alyssa Arney and Natalie Mik. Matthew Grant Anson was born in Santa Monica and grew up in the Glendale area. He first found an interest in photography while earning his BA in political science at Whittier College. He began shooting in underground LA punk shows located in people’s homes and backyards. Since graduating in 2013, Anson has expanded his subject to primarily street photography and exploring the humans, environments, and architectures within the limitless nature of the city. Anson’s use of the Metro as an artistic conduit dictates where his day of exploration will begin and is pivotal to his technique for weaving through the diverse fabric of the city. Curators Natalie Mik & Alyssa Arney, known for their previous collaborative project titled ‘Apartment Art’, a group exhibition that took place in Indianapolis this year in April, have again teamed up to create an engaging show where the city becomes the story and the artistic process the focal point.